A Lincoln native, Kimberly Beasley graduated from Lincoln East High School in 1995. She then went on to attend the University of Nebraska-Lincoln where she received a Bachelor of Arts degree (with Distinction) in Mathematics and a Bachelor of Arts degree (with High Distinction) in Music. She was inducted into Phi Beta Kappa, Golden Key National Honor Society and Pi Kappa Lambda, as well as a greek-alphabet soup of other music/math/academic honor societies. Upon graduation in 2000, Kimberly won an audition with the United States Air Force Heartland of America Band at Offutt Air Force Base, Nebraska. 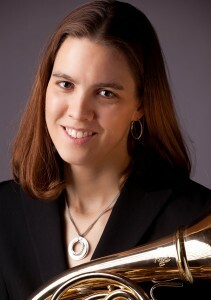 She was a founding member of Brass in Blue and toured the Midwest with five ensembles. By the time she separated in 2012, she had attained the rank of Technical Sergeant, was frequently honored with quarterly awards, and was named Airman or Noncommissioned Officer of the Year four times. She was also awarded the John L. Levitow Award and the Academic Achievement Award for Airman Leadership School in 2004, and was named a Distinguished Graduate for Noncommissioned Officer Academy in 2010. In 2014, Kimberly moved to Las Cruces, New Mexico with her husband, David, and their very energetic son, Zachary. She has since discovered a need to learn how to speak Spanish, is still surprised at waking up to mountains instead of corn fields, and gets a good laugh when the locals shut down the city on account of a couple inches of rain or snow. Kimberly currently performs as third horn with Lincoln’s Symphony Orchestra (since 2001), as well as 5th/Utility Horn with the El Paso Symphony Orchestra (since 2014). She also performs with the Lincoln Municipal Band and as a substitute musician with the Omaha Symphony, Roswell Symphony, and other local professional musical organizations in Nebraska and New Mexico.